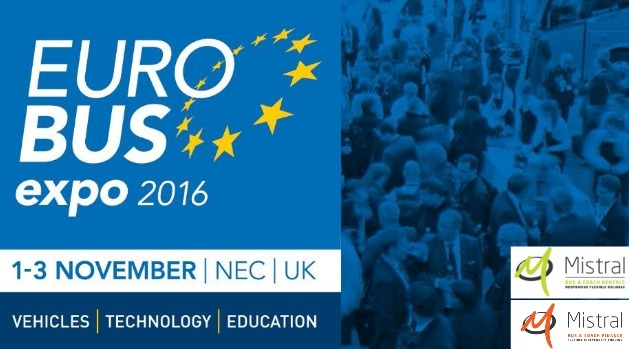 Mistral Asset Finance and Mistral Bus & Coach are attending Euro Bus Expo 2016. This free-to-attend, three day exhibition is one of the premier events for the bus and coach industry, bringing together every link in the supply chain under the one roof at the NEC in Birmingham on November 1-3. Come and meet our expert teams from Mistral Asset Finance and Mistral Bus & Coach at Stand F95 where we can demonstrate first-rate finance options for the bus and coach sector including Seasonal Payment Plans, Hire Purchase, Finance Lease and our exclusive Mistral Direct option. Mistral Asset Finance’s core values – flexibility, integrity, resources, speed and total UK coverage – have been consistently appreciated by our extensive client base and we look forward to demonstrating how Mistral can assist you. Meet our experienced team ahead of the event here and discover why it’s one not be missed by visiting the Euro Bus Expo website.